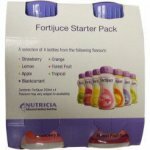 A nutritionally complete infant milk suitable for both infants and children with multiple food intolerances and malabsorption. Wash hands and sterilise all utensils according to manufacturers instructions. Boil freshly run water. Leave kettle to cool for 30 minutes. Do not use artificially softened or repeatedly boiled water. Measure the required amount of water (refer to feeding guide) into a sterilised bottle. Do not add powder to boiling water due to risk of scalding. Always use the scoop provided. Level off the powder with the back of a clean knife. Do not press/heap the powder. Add one scoop of Cow and Gate Pepti-junior to every 30ml (1 fl oz) of boiled cooled water. Add the correct number of scoops to the water. Adding too many or too few scoops can be harmful. Replace seal on bottle. Shake well (for 10 seconds) to dissolve powder. Remove seal, replace with a sterilised teat. Cool under running tap. Check temperature of feed. Feed immediately. 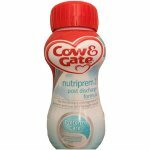 Older Infants and Children: From the start of weaning and beyond, Cow and Gate Pepti-junior may be used to replace cows milk in drinks or cooked dishes. Cow and Gate Pepti-junior should only be used under medical supervision, after full consideration of the feeding options available including breastfeeding. Pepti-junior is suitable for use as the sole source of nutrition for infants, and as a principle source of nourishment with other foods for children. Not suitable for parenteral use. Good dental hygiene is important for infants and children as prolonged or frequent contact of drinks and feeds with teeth increases the risk of tooth decay. Cow and Gate Pepti-junior is a special dietary food and therefore the taste, smell and appearance will differ from a standard infant formula. Never leave your baby alone during feeding. Take care when removing the the ring pull lid. Use feeds within 1 hour, discard unfinished feeds. If necessary cooled, boiled water should be offered between feeds. Do not heat in the microwave. Hot spots may occur and cause scalding. Replace plastic lid after use and store in a cool, dry place. Do not refrigerate. Use within 4 weeks of opening. Glucose syrup, hydrolysed whey protein concentrate, MCT oil, vegetable oils, emulsifier (citric acid ester of mono-&-diglycerides), calcium phosphate, potassium phosphate, potassium chloride, calcium carbonate, fish oil, choline chloride, sodium chloride, magnesium chloride, vitamin C, taurine, inositol, iron, sulphate, vitamin E, zinc sulphate, l-carnitine, uridine, 5-monophosphate, cytidine-5-monophosphate, adenosine-5-monophosphate, inosine-5-monophosphate, niacin, pantothenic acid, guanosine-5-monophosphate, biotin, copper sulphate, folic acid, managanese sulphate, vitamin A, riboflavin, vitamin B12, thiamin, vitamin D, vitamin B6, potassium iodie, vitamin K, sodium selenite. Contains Milk: The protein sourced from milk is extensively broken down and has a very low allergenicity.